The Headless City project began at ZK/U, the Centre for Art and Urbanism in Berlin, when I had a residency there in Summer 2014. It has become an attempt to devise a method for describing and understanding the contemporary city. It doesn't have a fixed meaning: it isn't a single concept. Rather, it’s a set of related ideas or descriptive approaches, some of which might be contradictory, or mutually exclusive. It might be used to denote the struggle against instrumental rationality, and could be valorised as some sort of liberatory gesture, aimed at recuperating structures of feeling, and patterns of human relationship, that have somehow been suppressed by the demands of neoliberal capitalism. 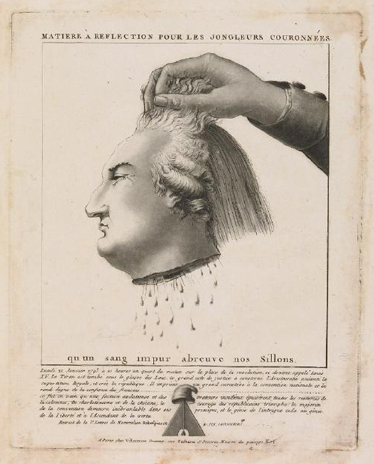 The state of ‘headlessness’ can be celebrated, maybe given magical or non-rational associations; after all, it’s derived primarily from the work of the French philosopher and social theorist Georges Bataille, who claimed that the Place de la Concorde in Paris, the place where the King's head was separated from his body, had acquired a sacred status through the shedding of the despot’s blood, an act which symbolises the painful birth and brutal, atavistic roots of modern democracy. Then again, it can also be problematised: the utopian architect Bruno Taut decried the contemporary Headless City as a place that had been rendered meaningless through decentralisation and endless expansion. He advocated a return to cities based on a prominent central Head, like Angkor Wat or the Capitol (from the Latin ‘caput’ meaning head), which would somehow stand for all the values that citizens would be required to share. The project emerged from a number of sources. In Berlin I read Denis Hollier's book Against Architecture, which deals with some of Bataille's writings about cities: I was intrigued by Bataille's ideas about how the museum fulfils a certain ritual function of the abbatoir in the regenerated city, and also by the notion of ‘dépense’, the account Bataille makes of the loss which cannot be made good, the expense which cannot be recuperated, the time which cannot be made useful. This chimed with ideas I’d explored while I'd been staying in Ljubljana (during which time I wrote the text ‘Infantile City’, an alternative guide to the city commissioned by the Office of Culture in the Municipality). In Ljubljana I had read theorists including Adolf Loos and Jeremy Till and had started to think about architecture as an active repression of those things which must be banished from the perpetually-regenerating city: death, waste, decay and so on. Hollier mentions Zola, and describes that great author’s pathological hatred of idleness, which he sees as the curse or ruination of the working class. In Thérèse Raquin, the faithless Laurent murders his mistress’s husband by staging an accident on a boating lake. It’s almost as if, for Zola, the spaces of proletarian recreation are themselves capable of engendering this sort of violence, this criminality. 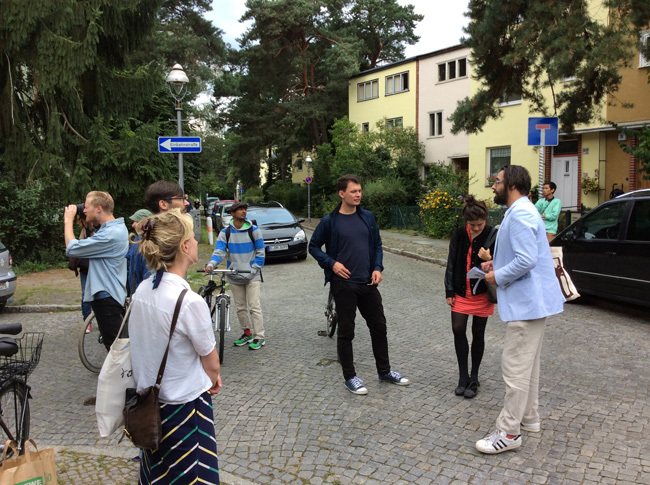 In Berlin I produced two preliminary outcomes of the Headless City project. 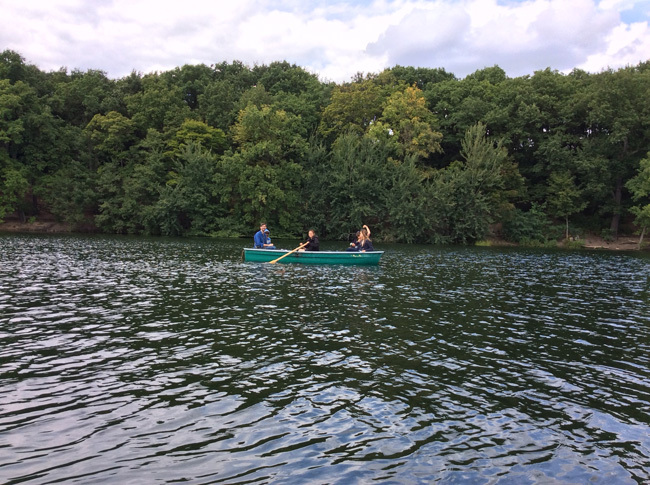 The first was a performance that took place on the Schlachtensee, a lake on the south-eastern edge of Berlin, and which took the form of a reading group on a couple of rowing boats, a swim in the lake, and a walk through a nearby housing project designed by Bruno Taut in the 1920s. We talked through the introduction to Hollier's book, and a text by Patrick Keiller which is collected in his book ‘The View From The Train’. 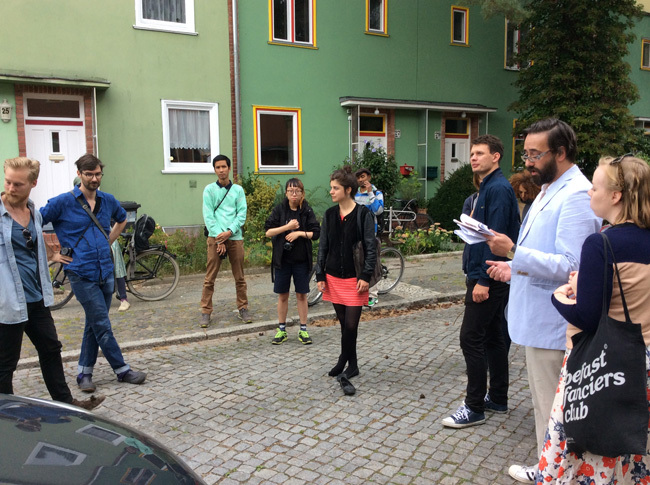 At the housing project, with the help of artists Rachel Brown and Bríghdín Farren, I staged a performative reading of Taut’s 1919 text ‘The City Crown’. 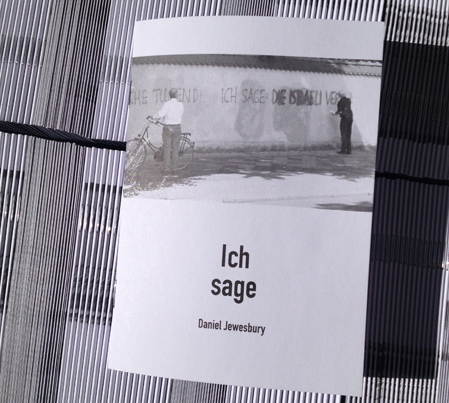 The second outcome was a pamphlet called ‘Ich Sage’, which contained photos I’d taken in the Moabit district of Berlin, where ZK/U is based, and a short text I’d written on the residency. The PDF of the pamphlet is here, downloadable as an imposition proof that can be printed double-sided on one sheet of A3, folded and cut into a 16-page A5 pamphlet. Rowing a boat, reading, having a swim, looking at some buildings, eating some dinner, drinking, watching a film and talking about how to use the contemporary city. 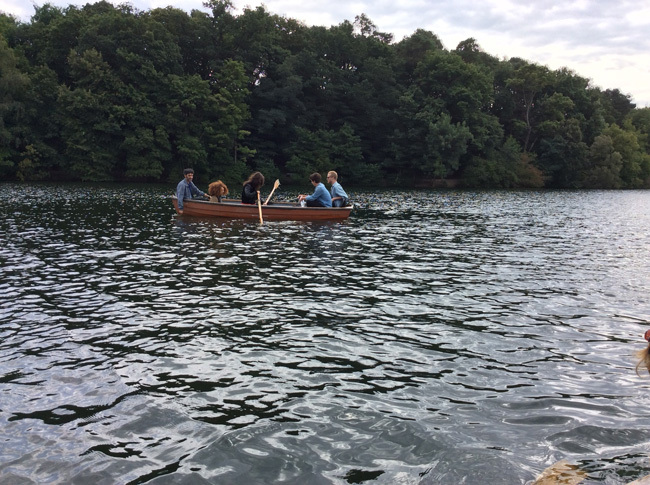 ZK/U fellow Daniel Jewesbury and Belfast-based artists Rachel Brown and Bríghdín Farren (who work collaboratively as Brown&Brí – www.brownandbri.com) are going out in a rowing boat on the Schlachtensee, to begin a day-long discussion about how to use the contemporary city. You’re welcome to join them at any stage of the day. The city is a captured space; nowadays it’s simply a huge financial instrument, an abstract device for producing profit. It is entirely privatised, not just in the sense of its physical spaces but in terms of the potential for us, as citizens, to ‘be public’ together. What can we do about this? What response could we make to this dreary diagnosis? We’re going to talk about a text written by Denis Hollier, which is an introduction to a book of his about Georges Bataille, called ‘Against Architecture’. 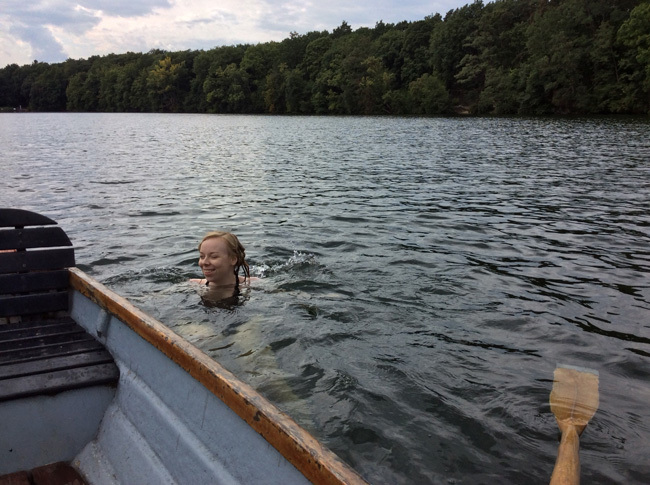 Then we’ll go swimming and spend some time doing nothing, just having a picnic and drinking – a non-productive use of space and time – before we carry on with the event in the afternoon. 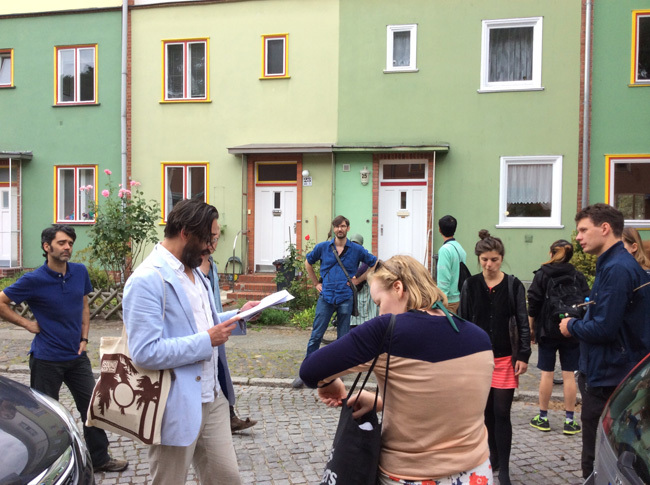 At 2 pm, we’ll take a walk along the Krumme Lanke, towards the housing development at Onkel Toms Hütte, designed by the utopian architect Bruno Taut in the 1920s. We expect to arrive around 2.30 pm. Here, we’ll be staging a performative reading of some texts by Taut, and questioning the narrow, prescriptive nature of Utopia. These texts will not be distributed in advance. Finally, in the evening we’ll make a small dinner at ZK/U, give a presentation on the day so far, and screen a film – Marco Ferreri’s Touche Pas À La Femme Blanche (Don’t Touch The White Woman), starring Marcello Mastroiani and Catherine Deneuve. The film is a bizarre détournement of the Battle of Little Big Horn, set in the Trou des Halles, a huge hole in the ground in Paris in the 1970s. It speaks to us today just as directly as when it was first made. The Headless City is now a kind of umbrella for all my other current projects. 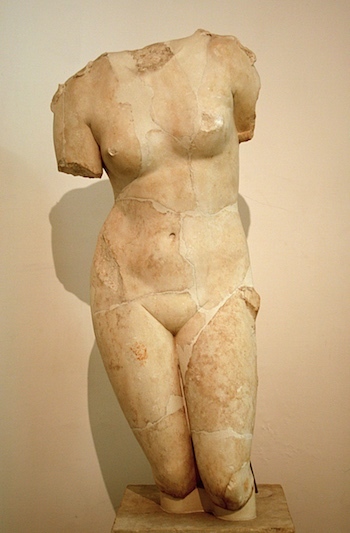 I’m trying to link together the exploration of gesture and sexuality in Looking at the Woman in a Bomb Blast, with the focus on death and the city (ancient and modern) in Necropolis and Temple of Hercules. I want to explore further the Headless City as a licentious, sensuous experience of being in the city. In 2016 I curated the TULCA visual arts festival in Galway, under the theme of The Headless City. My intention was to find out how this ‘method’ can help us to understand the potential ‘meanings’ of a disparate range of concepts. Most particularly, the death of the city that’s been brought about by neoliberalism’s ruthless financialisation of urban experience; it’s now possible to understand entire cities as single (albeit extremely complex) financial instruments, with each of us — employees, mortgage-holders, consumers — merely the variables in the formula. With the artworks and events that were collected together for TULCA, I wanted to see proposals for how we might live after the plunder has finally been completed, after the cities have collapsed under the weight of their own contradictions, when they’ve finally become impossible to live in. What do the ruins of past civilisations tell us about the cities of today? The catalogue for The Headless City contained a long essay introducing my research, as well as texts on each artist and event, and a specially commissioned text by artist Jim Colquhoun. The full catalogue is available to read online or download via academia.edu here, or via TULCA here.